Maya Lin, Storm King Wavefield, 2007-2008, Earth and grass, 240,000 square feet (11-acre site), Storm King Art Center, Mountainville. The artist Maya Lin is best known for her elegiac Vietnam Veterans Memorial in Washington, DC. Completed in 1982, “The Wall” is one of the most recognizable works of American sculpture of the past half-century or more. Remarkably, her design for the memorial was conceived while she was still an undergrad at Yale. The noble simplicity of the concept and of the design, a polished black granite wall chronologically listing the names of those killed in the war, demonstrates the flexibility of the minimalist idiom to convey content that goes beyond the formal facts of the work. 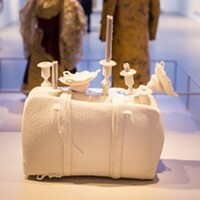 Since then, her impressive output reflects a conception of sculpture as an expanded field that embraces both landscape and architecture. Storm King Wavefield is Lin’s most recent large-scale project and represents her ongoing interest in the language of nature. 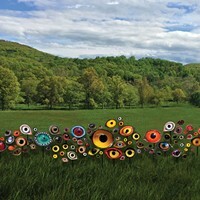 Commissioned by Storm King Art Center, it opens to the public on May 9. Set on an 11-acre site that was formerly a gravel pit, the piece consists of seven rows of undulating hills shaped like ocean waves; each row is over 300 feet long. The Storm King Wavefield is the third and, according to the artist, the last in a series that includes earlier, smaller works installed in Ann Arbor, Michigan, and Miami. The piece can be approached from several directions, but the most surprising may be from above. Looking down from the top of the hill that frames it at the north end, the ground gently ripples, echoing the surrounding hills and ridges. From above, Wavefield appears subtle and is dwarfed in scale by the landscape. Descending the hillside, the experience is similar to that of landing in an airplane, as what only seconds before had appeared to be dollhouses, toy cars, and trees quickly becomes full-size. A similarly radical change in scale takes place as you experience bodily the relationship between the height of the crests of the waves and the depth of the troughs. The peaks of the waves, cresting at 10 to 15 feet, soar overhead, and the surrounding hills are obscured from view. The waves themselves reveal the sensitivity of the artist’s eye to the subtle trigonometry of natural waveforms, whose beauty lies in their complex simplicity. It’s interesting to walk though the troughs and up the waves, from whose peaks you are given yet another perspective of the landscape and your relationship to it. Ultimately, like much work produced with the minimalist mindset, the piece is less about itself and its own internal relationships than it is a discourse on its site and the relationship of the viewer in this triad. 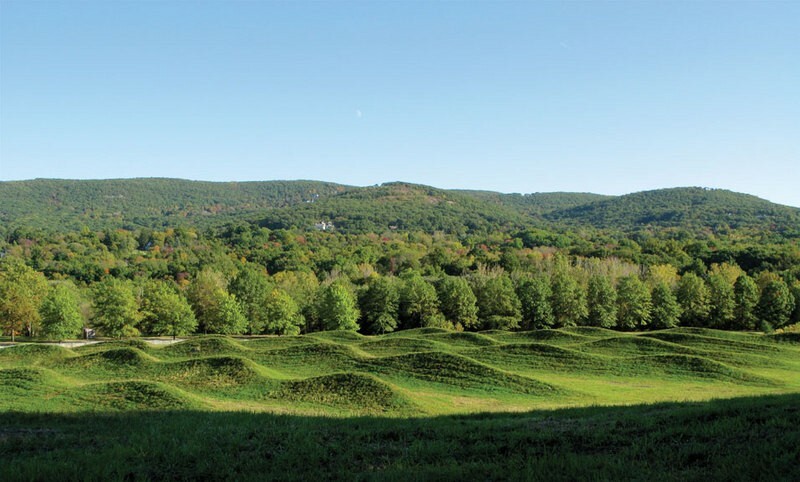 Wavefield is situated near two other commissioned pieces that are highlights at Storm King: Richard Serra’s Schunnemunk Fork and Andy Goldsworthy’s monumental Storm King Wall. The literal proximity of the Serra piece underscores the kinship that Lin shares with this old master of American sculpture, whose work so clearly informs Lin’s Vietnam Veterans Memorial and much of her output since. And the waves of Wavefield echo the undulations of Goldsworthy’s Wall as it wiggles its way through the trees. Working in close coordination with the New York State Department of Environmental Conservation and with landscape architects Edwina von Gal and Darrel Morrison, Lin utilized the gravel at the site to create the underlying structure of Storm King Wavefield. This was then covered in topsoil, which in turn was planted with a variety of indigenous grasses, creating a natural drainage system. In addition, she kept track of her travels to and from the site, as well as the energy used by the contractors who executed the work; as a final stage in the process, Storm King and Lin are formulating a plan to plant indigenous trees around the periphery of the site to help offset the calculated carbon footprint generated by the production of the work. Any visit to Storm King provokes questions about the nature of sculpture and its relationship to site. It is no longer possible, much less desirable, to regard the land with the same kind of neutrality that is presumed of the white walls of an art gallery. It is obvious that Mother Nature does not want the forms and structures that we make on and of her—she is constantly trying to reclaim them with her processes of growth and decay. Much of the work at Storm King appears oblivious to this dialectic, but pieces like Serra’s, Goldsworthy’s, and, now, Maya Lin’s Wavefield make explicit the often awkward and always paradoxical relationships between art and the land. This makes their beauty that much more intriguing.